It is the knowledge of the origin of the human being. From where one has come, how one has come, why one has come and the return to one's origin, showing how man will return to his natural state of pure, clean and perfect rational being. All this through the messages of the RATIONAL SUPERIOR an extraterrestrial being, published in the Books "UNIVERSE IN DISENCHANTMENT"
BESIDES THE RETURN TO ONE'S ORIGIN, WHAT WOULD BE THE OBJECTIVES OF THE RATIONAL CULTURE? To connect the human being to his World of Origin, the RATIONAL WORLD, through the Rational development which is attained by reading and re-reading the Books "UNIVERSE IN DISENCHANTMENT". The reading of the Book brings the perfect physical, moral and financiaI equilibrium to the life of matter, that culminates with the Rational Clairvoyance, when the reader will get in touch with the Inhabitants of the RATIONAL WORLD, the world which we are native of and to which we are now returning. HOW CAN ANYONE VERIFY THE REALITY OF THE OBJECTIVES OF THE RATIONAL CULTURE? Very simple: because of being a process of development, it will not be just through the reading of the first volume of the Book that the person will have these verifications, although they have happened to many persons. They are the appearance of lights of divers hues, sizes and formats; the direct contact with extraterrestrial beings, having dialogues and being oriented everywhere. And that which is more important, which is to acquire ife inner peace. It is how we start to learn what is true hoppiness. That which had long been announced by the prophets, sages, astrologers and by science has code to the world. I transcendental knowledge that surpasses all the expectations of the human knowledge and which discloses the mysteries of nature and of the Rational animal in a simple, clear and logical form. It is not a knowledge extracted from the learnings of this world, but the truth of truths given by the RATIONAL SUPERIOR. The RATIONAL SUPERIOR will lead humanity to the UNIVERSAL RATIONALIZATION. And thus, with the assiduous reading of this knowledge, everyone, without any effort, very naturally, without the need of attending any place, will be oriented in everything, receiving the orientations required for one's perfect moral, physical and financial equilibrium, inside one's own home or wherever one happens to be. Therefore, there is no temple, synagogue or house of preaching, nor obligations, for it is just the reading of this grandiose Literary Work "UNIVERSE IN DISENCHANTMENT" that gives the protection which up to now no one had known. All the diseases that exist in the world are caused by the alteration of the biomagnetic field. The world is an assembly of eletromagnetism and consequently we are also formed of eletromagnetism. It is the alteration of this energy field that causes in us all the diseases like the cancer, the infarct, the osteomyelitis and each and every kind of illnesses. The excess of magnetism kills, the excess of electricity kills the same way. And we are subject to the effects of these two monster fluids: the electric and the magnetic. There are no miracles in the RATIONAL CULTURE, everything happens naturally, the solutions are the consequence of the perfect equilibrium which the person acquires through the reading of the messages of the RATIONAL SUPERIOR. As the person goes on reading, one comes to be connected to one's World of Origin, the RATIONAL WORLD, from where one will receive all the orientations required for one's good living. 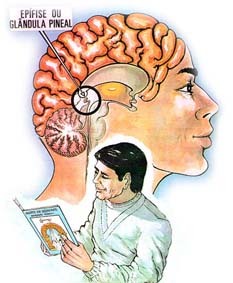 With the development acquired through the reading, the person starts to disconnect oneself from this eletromagnetic assembly which is the world we live in, in order to be connected to one's true natural, the world of one's true origin, the RATIONAL WORLD. Substituting one's eletromagnetism by the RATIONAL ENERGY, reaching the condition of the RATIONALLY IMMUNIZED and when one dies, one will no longer be born here in this world, but in one's true world, the RATIONAL WORLD. The cause for everything being without regulation, the cause for the disequilibrium of everything is the ending of the phase of thought. For you know perfectly well that there is no effect without cause. The cause for this great worldwide disequilibrium is the ending of thought. And in order for you to find the equilibrium of everything, you have to come to know nature and nature's natural phase, which is the RATIONAL PHASE, the phase of reasoning. The thought has stopped working because its phase has ended, the minds have stopped, the regulation has stopped and you are without regulation, and without regulation, the violence. The cause of violence is the paralyzation of the thought, because the phase of thought has ended. While the thought was in force, in its phase, everyone more or less with regulation. After the phase ended, everyone completely without regulation, because in the matter it is this way: everything that has a beginning has an ending. And for the normalization and the equilibrium of everything and everyone to be achieved, one has to come to know nature's natural phase that is in force, the RATIONAL PHASE. The function of the thought has ended, there being born in nature, through natural circumstances of her evolution, the RATIONAL PHASE. So that in the RATIONAL PHASE, there may happen the moving of everyone to one's natural world, the RATIONAL WORLD. And that is why the RATIONAL WORLD is the world of reasoning, the world of reasoning is the RATIONAL WORLD. Developing the reasoning, with the culture of the RATIONAL PHASE which is nature's natural. The phase of thought has ended and we are in the phase of reasoning, the RATIONAL PHASE. The phase of thought has ended, thence the violence was generated. The violence was generated throughout the world because the phase of Thought has ended. The thought has stopped and the violence got generated. If the thought were functioning, there would be more or less the equilibrium as it had always been before the change of phases that happened in 1935. Before 1935, the thought was functioning; more or less there was equilibrium, everyone more or less in equilibrium, there was respect for everything and everyone, and there was love for one's fellow man. From 1935 up to now, the world has been filled with convulsions. Everything got convulsed in an astonishing way, like everybody is astonished with the happenings all over the world. And the cause for all this: the end of the function of thought. Because this is the way it is in the matter, the thought had its beginning and its end had to come; for in the matter everything is like that, everything has a beginning and everything has an ending. Everyone, in order to reach equilibrium, has to become united to nature, to the phase of nature, to the Rational Phase, for the development of reasoning and for everything and everyone to become Rationally equilibrated. And in order to develop the reasoning, it is only reading and rereading his culture, the RATIONAL CULTURE. The culture of the reasoning is the RATIONAL CULTURE. Therefore, the cause for all evils universally is the end of the phase of thought. The phase of thought has ended. the thought has paralyzed. And the paralyzed thought is the cause of the disequilibrium, it is the cause there exists the violence that has been astonishing everyone and more and more has been frightening every one these days. Why all this? The phase of thought having ended in 1935, the world is undergoing horrible and terrible moments, difficult moments, because of not knowing the recuperation phase, the Rational Phase. And thus, here's how to recover the lost equilibrium: the development of reasoning. Everything arriving at the right time and at the necessary time. There's the cause for the violence and for everything that is going on, and how to straighten everyone and everything, being recuperated through the culture of the phase that is in force, the Rational Phase. All this because of your ignoring nature's changing of phases. The phase of the Rational animal, which was the phase of thought, has ended and the Rational Phase, Which is nature's natural phase, has started. Therefore, no one is to blame for all this that is going on in the world but rather nature's change of phases, unknown to humanity, and one has to come to know it in order to recover the equilibrium.